Trulshik Rinpoche passed away on September 2 2011. 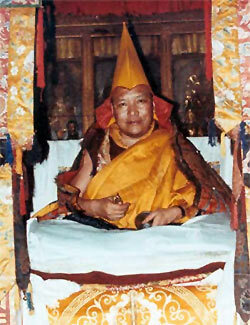 Rinpoche finished his meditation three days later. One of the greatest living masters of the Nyingma tradition of Tibetan Buddhism, Trulshik Rinpoche was a leading proponent of the Rime, or non-sectarian, spirit of Buddhism. One of Lama Zopa Rinpoche’s gurus, he lived in the Solu Khumbu region of Nepal, which is also Lama Zopa Rinpoche’s birthplace. Trulshik Rinpoche was the closest and most realized disciple of the late master, Dilgo Khyentse Rinpoche. It was prophesied in Khyentse Rinpoche’s visionary teachings (terma) that Trulshik Rinpoche would be the spiritual heir to his teachings, and in his absence, Khyentse Rinpoche referred all important matters to Trulshik Rinpoche. Upon Khyentse Rinpoche’s passing in 1991, Trulshik Rinpoche was entrusted to find his reincarnation. He also visited the West several times to give teachings to fortunate students.